One of my ultimate favorite things to eat, even as a meal, is a big bowl of cold salad....especially when the weather's super hot or humid, it's perfect. I grew up with large traditional Filipino meals. A typical dinner cooked by my grandma at home would usually consist of rice, 2 or more main dishes plus appropriate dipping sauces and ice cream for dessert. Salads were hardly a part of our daily menu except on "special days" when we would have steak for dinner. I got used to that way of thinking so before (crazy as it sounds), preparing salads always translated into a big production in my kitchen including matching wooden bowls and salad forks. It used to take up so much time and preparation on top of cooking our main meal that I often just skip it because of laziness. And then I discovered Juju Eats and realized that salads are just salads, nothing special. It can be eaten from any kind of bowl, it doesn't have to look spectacular as long as it tastes good. I keep it super simple. First up, I make sure to buy ready-to-eat, pre-washed, organic mixed greens (saves a lot of time and effort). All I have to do is dump it in the bowl. As toppings, my staples are just free-range hardboiled eggs that I mash with a fork in the same mixing bowl. If I have left-over chicken breast, I add that to the mix as well. It's a great pre or post workout meal and I usually have the entire bowl to myself. It's either I have salad dressing but no greens or worse, days when I still have a lot of lettuce in the ref but run out of dressing. Lettuce wilts easily and it's such a shame to put to waste. When that happens, I usually add it to my green smoothie. If it's still salvageable and I have no time to hit the grocery for some dressing, I make my own, here's my super simple recipe using ingredients that we usually have stocked in pour pantry at all times. If you want it super healthy, you can use fresh strawberries but this is more of a quick fix using what you already have which is why I chose jam. Chuck everything into the blender and blend for a few seconds until thoroughly mixed and thickened. Transfer to an old glass bottle and store in the refrigerator to use whenever needed. ooooh, so strawberry jam is the magic ingredient! thanks for sharing the recipe. 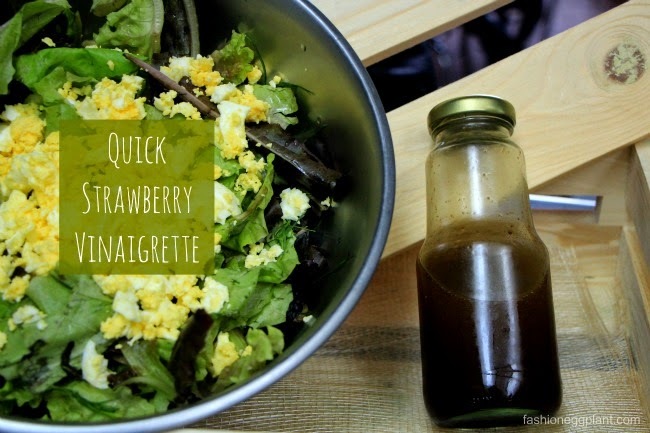 i've always wondered how to make vinaigrette. hi! interesting post. I'm looking forward to it. waaaasssaapppp.. I wanna see you at the gym. bat di tayo nag work out? Ive been training hard for a month or so now with T25 (Shaun T's workout) and it has really given me and my body full strength and I would loooove to try Crossfit (been dying to try that but never get a chance to) and see what it has in store for me.